InSinkErator has cemented its place as one of the most respected household appliance brands on the market today. Top of the line products like the InSinkErator Evolution Excel garbage disposal are the reason why. This food grinder manages an astounding combination of power and features that's capable of getting the job done without waking up your household. With the InSinkErator name etched into the unit, you can be sure that quality and longevity won't be an issue. 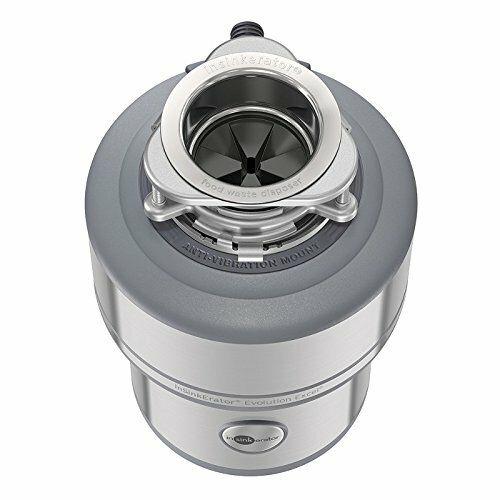 Why the InSinkErator Evolution Excel? Whether you've been weeding through hundreds of replacement garbage disposal options, or you've lucked into reading about the InSinkErator Evolution Excel first, you can rest assured that you haven't overlooked the premium model from one of the top brands in the industry. The InSinkErator Evolution Excel is not an entry level garbage disposal. It boasts a 1.0 horsepower motor, which is among the most powerful in household garbage disposals. Making the Evolution Excel the perfect disposal for households that need to process a lot of food waste. The stainless steel construction, and superior build quality, allows InSinkErator to offer an industry leading 7-year warranty which covers parts and in-home labor. This garbage disposal has all the bells and whistles. But despite all of the features, you can probably handle the installation yourself. Especially if you're replacing an exisiting garbage disposal. The InSinkErator Evolution Excel is the perfect purchase for a homeowner who is looking to upgrade their garbage disposal, yet doesn't want to worry about problems for years to come. Worry Free - After you've installed the InSinkErator Evolution Excel, there's no need to worry about the "Can't Go Down the Garbage Disposal" items anymore! Chicken bones, coffee grounds, egg shells . . . there's not a food item that this machine can't handle. Easy Installation - Installing the Evolution Excel couldn't be easier. It takes less than an hour to disconnect your old disposer and mount the new one using your existing hardware. Optional Power Cord - If you're replacing an old disposal, save yourself some money and use the same cord. But if you're installing the InSinkErator Evolution Excel where there wasn't a disposal before, you can order the model that includes the power cord. In-Home Warranty - Buying a household appliance can be nerve-racking. However, the 7-year parts and labor warranty should help put your worries at ease. But, it's not just the length of the warranty that's comforting. The in-home warranty means that for those 7-years, if anything should go wrong, a certified technician will make a house call to assess and fix the problem. Large Size - The powerful 1 HP motor, and all the bells and whistles, means that this is one of the largest garbage disposals on the market. Although, it should fit under nearly any sink, the 9" x 9" x 13" footprint may make storage space a bit tighter. You may just need to find a new place to store the box of trash bags. Installation Could Pose a Challenge - Although installation is easy, the fact that the Evolution Excel weighs 26 pounds could be slightly challenging . . . especially if you are doing it by yourself. You'll need to lift the unit up to the mount that's located under the sink. This could put you in a precarious position. The Evolution Excel is InSinkErator's flagship garbage disposal. Designed and built by a company known for manufacturering quality products, this model boasts all the bells and whistles one might expect. Most people don't have "water cooler talk" around a garbage disposal, but you could with this one. InSinkErator's SoundSeal® Technology makes the Evolution Excel so quiet that you won't have to pause Game of Thrones while you dispose of last week's leftovers. Under normal circumstances this disposal puts out a mere 25 decibels of volume. That's one-twentieth the volume of a standard vacuum cleaner. In fact, the Evolution Excel is our top choice when it comes to quiet garbage disposals. Read our article and review. Remember when we said you could put chicken bones down the InSinkErator Evolution Excel? MultiGrind® Technology makes doing so possible. Most competitors, and even InSinkErator's alternative products, only offer a two-stage grinding system. 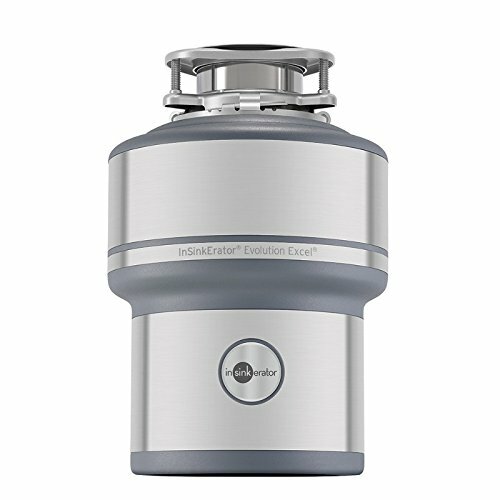 This can limit what types of food and how much food the disposer can handle. 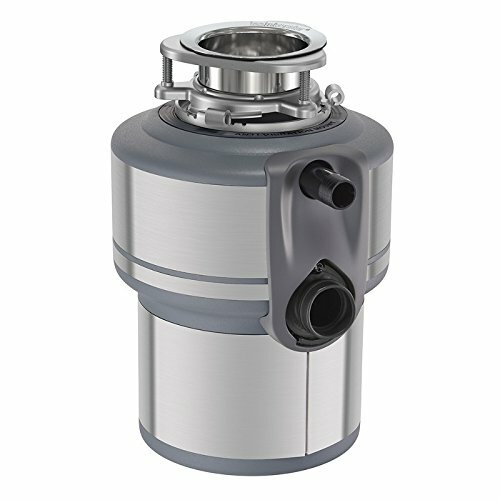 Three stages of grinding allows the InSinkErator Evolution Excel to turn any food item into a pulp so it can safely travel thru your waste water plumbing. The Dura-Drive® Induction Motor is the foundation of InSinkErator's dependable and long-lasting garbage disposal. With the 1 HP motor, the InSinkErator Evolution Excel is capable of producing 1725 RPM. This means that it's designed to dispose of large amounts of food quickly and easily. The 40 oz. stainless steel grind chamber is among the largest on the market. Its capable of accommodating vast amounts of food without getting clogged, making it an excellent option for large families. Many garbage disposals on the market use plastic or low quality metal parts and teeth. These inferior parts simply can't withstand the challenging wear and tear a garbage disposal can dish out. The grind chamber and components in the InSinkErator Evolution Excel are made of stainless steel, giving you years of worry-free use since they'll be protected from rust and corrosion. If the 1.0 Horsepower motor begins to slow, the Jam-Sensor® Circuit will trigger and jump into action. The motor's rotational torque is increased up to 500%, while pulsing simultaneously 60 times per second. Before you even know a problem was approaching, the Jam-Sensor® Circuit broke thru with it's powerful hammering effect. The Auto-Reverse Grind System changes the direction of the grind each time the InSinkErator Evolution Excel is turned on. This feature not only provides additional insurance against jams, but it also ensures that the components wear evenly, extending the service life. This feature makes replacing most brands of garbage disposal as easy as unscrewing the old unit and twisting the Evolution Excel into place. When you buy the top of the line garbage disposal, it's nice to save the money it would cost to pay for professional installation. The Quick Lock® Sink Mount makes installing the InSinkErator Evolution Excel one of the most accessible DIY plumbing projects. The peace of mind that comes with this warranty can't be overstated. The in-home warranty means that you don't have to stress over shipping back a malfunctioning unit or purchasing new parts either. The bottom line is that if you buy the Evolution Excel, and it breaks, then InSinkErator is going to make sure that you're taken care of from the comfort of your home! It doesn't get any easier than that! If the InSinkErator Evolution Excel fits into your budget, then there isn't a garbage disposal that'll be more satisfying to own. Its performance is unmatched and it comes with a warranty that eliminates the need to worry. With it's powerful and quiet motor; quality and long-lasting design; and easy installation, it's hard to go wrong with this garbage disposal. Although, not everyone needs the best garbage disposal on the market. Spending top dollar on a disposal only makes sense if you and your family needs an appliance that can handle large amounts of food waste. For families that don't push their current disposer to capacity there are more affordable options that should work just fine. That being said, most garbage disposals aren't going to "wow" you or have you screaming from the mountaintop about how easy it is to process your food waste. But, the InSinkErator Evolution Excel is made to impress, and you might find yourself singing it's praises. It really is that good. 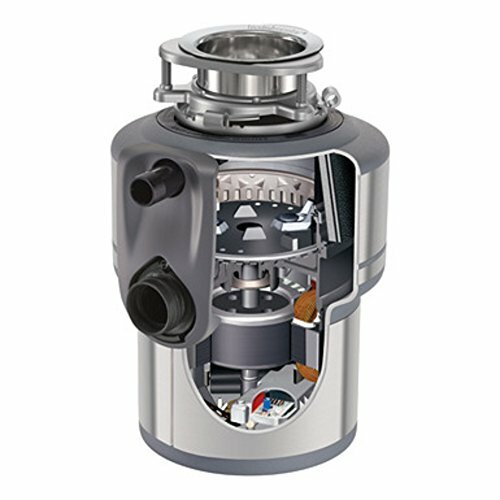 Do you have limited space under your sink or want a garbage disposal that's not quite as heavy? Try the InSinkErator Evolution Compact. Homeowners with septic tanks may want to look into the InSinkErator Evolution Septic Assist. Its designed specifically to support septic systems. If you're looking for sheer power in a garbage disposal, but don't want to spend the extra money on fancy features, then the 1.25 horsepower American Standard ASD-1250 could be right for you.